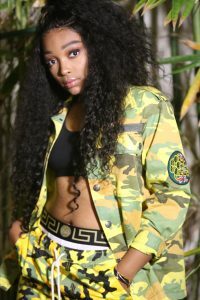 Rap artist Jaaziah Smith, widely known by her stage name Laady J, was born on June 11th 1998 in Livingston, NJ and was raised in the borough of Newark. Growing up, Laady J had always carried a strong affinity towards rapping. Often times to escape reality, Jaaziah would hide in her closet rapping over instrumentals for Instagram. After receiving great amounts of flattering remarks she realized that her talents should not go unheeded. Since then, she’s been recording at various studios producing her first hit singles ‘Draco’ and ‘Bussit’. What contributed to Laady J’s interest in music industry is watching her mother, as an adolescent, do music herself. Moreover, she is known for being the daughter of Trigga the Gambler and niece of Smoothe da Hustler who discovered Foxy Brown. From her musical influences that derived from her family, to who she is and where she is from all fused together is what generates Laady J’s unique sound. Without a doubt, the young star is set to shift the culture with her fiery passion to be the industry’s greatest female mc.